Jon and the team are always polite, friendly and helpful. They do a great job at fab prices - and just because its a Vauxhall center doesn't mean they can't look after other marques. Thumbs up from me. Cannot fault these guys. Not only did they get the car back to me quicker than was first thought would be the case, the final bill was less than quoted amount prior. Result! Overall they saved me nearly 400 quid on what the main dealers wanted me to pay! Enough said. Just so wonderful to have quality workmanship and to boot not be bled dry!! "an absolutely cracking garage for all repairs." "Trustworthy, efficient and good value." Booked in following advisories from Mot , replaced front brakes pads and discs and renewed tyres at quoted price , returned to pick up as arranged to be told they had replaced my rear brake pads free of charge .
" excellent work at a price that is right , genuine parts and excellent service"
visited this garage at the beginning of march with a very poorly clutch.the price sounded expensive ,but when i shopped around it was very reasonable ,mainly because they use genuine parts not reconditioned like some of the big clutch centers. while my car was there i knew that it needed new discs and brake pads and so i enquired about a total price about all the work. in a nutshell John did me a deal, i was very pleased especially with the end result . and so this week i returned with my wifes car expecting a few problems but no it sailed through £35 for an MOT bargain!!!! will i go back take a guess its nice to know you are not being fleeced and the young man that served us was extremely polite and jolly. Excellent garage that solved the power loss on my Insignia that baffled 2 previous garages! Also free courtesy car too! Will definitely use these guys in future can highly recommend. "Very professional and honest garage "
Highly recommended .. Far exceeded my expectations.Excellent work ,very Proffesional and very honest .. And staff are very friendly and as a woman going to a garage they make you feel very comfortable ..,Been going to this garage for years now and I won't go to anyone else ..
"Couldn't ask for better service"
Left my MOT to last minute as always. No problem booked me straight in unfortunately my car failed on a few items. Repairs sorted straight away. Got phone calls explaining what my car had failed on and cost of repairs. My car was kept safe and locked away and was offered a courtesy car. I didn't have to chase the team once. They called me to keep me updated all the way through the repairs. Can not recommend this garage and the team enough. "Excellent service always guaranteed, trustworthy, top team"
"Brilliant garage with a brilliant set of lads "
A great bunch of guys with many years experience in the vehicle trade. Highly recommended and would use again and again. Jon really knows his stuff. "One in a million :)"
Fantastic service and workmanship. First time used for work on car as been to another garage for years but was recommended to try them and will be using them from now on. Can't recommend them enough. "Excellent, reliable, honest, highly recommended"
I have used this garage for years for various vehicles I've had. Despite being always busy, Jon and the excellent lads there would always fit me in around whatever they were doing and get me back on the road again. Vital for myself as my car was my business. Nothing was too much trouble for them no matter how minor. Always free loan cars available when required, keeps you updated on the progress of the job, never does anything not previously agreed with you before phoning you and discussing it first and getting your permission. Just good honest advice. Prices I found very competitive, very decent, excellent value. In summary - excellent and highly recommended. "friendly very helpful and good to get on with"
"Professional garage and excellent customer service from a team of mechanics which take pride in their work. " I have used the Vauxhall Repair Centre Ilkeston now for the past 5 years. During which time my cars have been serviced/MOT/ and repaired various items on cars from 1 to 15 years old. One item which makes the Vauxhall Repair Centre Ilkeston standout from other garages is their attention to detail. When your car has a service at even 1 year old the wheels shall be removed and brakes checked. Quite a few main dealer and independent garages may not even remove the wheels during a service. This results in you not being able to remove a wheel when a puncture occurs! If any work beyond what is expected is found the mechanic working on your vehicle shall call you and explain the work required before continuing to seek permission to continue work on your vehicle. The availability of a courtesy cars is never a problem with around 20 cars available to customers to keep mobile whilst their vehicles has work carried out. The courtesy cars may not be up to main dealer standards but it maintains the mobility of the customer. Courtesy cars range from small Corsa's to larger Zafira's. Manual and automatic gearbox also available. 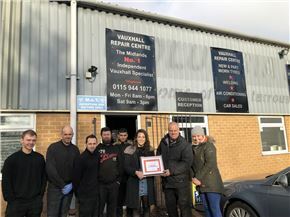 Overall the Vauxhall Repair Centre Ilkeston is a traditional customer oriented garage delivering a professional highly competitive value for money service. Give them a try once and you'll not use another independent garage again! "Fast, professional value for money"
"Response to slanderous comment previous "
"Don't realise who they do work for?" Garage MOTd a car we bought from manor car sales. It failed was supposedly repaired and then passed next time round. However faults still on car, I now find out the owners are mates and the guy we bought from is a con man with trading standards after him. So just how reputable is THIS garage??? "The best and most trustworthy place to take your car"
I won't take my car anywhere else the staff are all very knowledgable and professional any problems with your car are explained in simple terms, no gobble-di-gook...and competitively priced for the service you get...everything is covered so if your looking for somewhere trustworthy and reliable look no further ! "A good honest professional service, quite a rarity nowadays ! " A good honest professional service, quite a rarity nowadays ! "Clear,honest,expert diagnosis and detailed quote within minutes of your arrival and courtesy cars freely available"
"honest ,trustworthy,quality service guaranteed. " I had a broken front suspension spring and they fixed a new one in for me while I waited realy satisfied with any work I have had done hear at Vauxhall Repair centre -i wouldn't trust any one else with my Vauxhall these people are the experts. "good job well done at a good price"
I have just had my car serviced and mot tested and yet again the experience has been great. Price quoted was the price I paid, kept me informed throughout the day and the only thing I needed was a bulb which I already knew about.thank you for restoring my faith in garages guys.superb!! "The best garage i have ever used!!" The pride of joy which is the Twin Top Astra started Bonging.. then the roof closed and the cycle would not complete and boot would not open.. after a pain staking drive of mile after mile BONGING.. the boot had opened but the roof would not open again. Looking on the net we found Vauxhall repair ctr. We dropped the car off with a hire car available ( most helpful) dealing with Jon and Simon the friendly service was not like any other garage. After two days we had the car returned and working fine but the same problem had arisen. Phoning the garage we took the car back ( another hire car available ) they got working on the car straight away ... wiring loom is the issue, they repaired the damage and charged us very little... the best and the most friendly honest garage ever used....HIGHLY RECOMMEND !!! having been charged over £400 to try and fix the electric roof on my twin top astra and the main dealer getting nowhere I decided to take my car out of the dealer and find a roof specialist. I couldn't find anybody who would even look at the roof on my car and all I kept getting told was ..its a main dealer job only even though they had spent 8 hours on it and got nowhere. It wasn't until a workmate told me to try the Vauxhall repair centre in Ilkeston I thought I was stuck with a convertible that didn't work. I rang these guys and immediately felt at ease and they sounded like they knew more than the main dealer! I took my car in and the following day got a call to say they knew what the problem was and it would cost £235 to fix (some sort of motor thing was needed) Well true to their word I collected my car and am now enjoying the sunshine with the top down. I wont be going anywhere else in future for any car work,these guys are the real deal and also kept me mobile with a loan car while they had mine. anybody needing any repairs/servicing give these guys a call you will not be disappointed. Took my Vauxhall astra in to this garage after being recommended by a friend to use them. I can honestly say it has been the best experience of a garage I have had in over 20 years of driving. my car needed a few items when it was serviced and the mechanic who was working on it actually showed me the problems with the car on the ramp!! the price I paid was fantastic as well, (I did a bit of research after and it was by far the cheapest price of them all) I have never bothered to review a garage before or recommended a garage to other people but lets just say all of my friends and family have heard about this garage and will be trying it out. absolutely 5 star service from really nice friendly guys that make you feel comfortable and at ease. I would recommend anybody reading this to use this garage. "not the vauxhall repair centre on manners ind estate"
Thanks for the great review ryan although i think ypu meant your dads garage. Does he really charge you to service his own sons car?? Nothing surprises me. "Genuine Vauxhall Garage Using Genuine Vauxhall Parts. Very Pleased." Took my car to be serviced, and the price was almost half price than the main dealer. When I picked my car up, it has been washed and cleaned inside and out too. I was very pleased with the level of service. Everything about this garage is top rate, courteous staff, very helpful and polite. I only went in for a service and when I collected my car the lads had serviced it and washed it for me. I can honestly not fault this garage at all. "PROFESSIONAL EXCELLENT SERVICE BETTER THAN MAIN DEALER ! " I have been using this garage for sometime. I can recommend them with out hesitation. Even if you do not own a Vauxhall. The new facilities are top notch & prices more than fair. If you want a garage you can trust look no further. Oh & by the way the free loan car is FREE ! no nasty sting for money to insure it for a day unlike any other garage I USED to use. "New Location - Same Fantastic Service"
"Excellant repair service at a reasonable price"
I have a one year old Vauxhall which i took to Evans Halshaw to have the ABS light fixed. I was told that my vehicle had been in an accident (which could have been caused by a speed bump or pot hole), and would not be fixed under Warranty. Total cost of repair - £897 - to include new abs hub, front arm, drive shaft leak, abs wiring and tracking. i looked for a local Vauxhall repair centre who would use genuine vauxhall parts and not invalidate my warranty (which really isnt worth the paper its written on), and found the Vauxhall Repair Centre at Ilkeston. The service was excellent, nice polite mechanics, who showed me exactly what was wrong with my car, and fixed the real problems - abs wiring, new front arm and tracking - costing me a total of £153. I would definitely use this garage again, and would recommend it to anyone else with a Vauxhall - or any other make of car for that matter. Anyone who uses a Main Dealer should definitely get a 2nd opinion.